Bought this at Deadfest 2004 after 50Caliber's show. Billy almost gave me like 200 swedish crowns as change cuz he didn't have clue are 20kr coins like 20 cent coins or something. I had to correct him so i got the right change eventually. 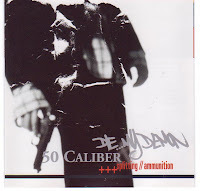 I don't care that much of DMD's side but 50 caliber is great. Got clue if their mcd's are still available?